The most distressing observation I’ve made over the last 20 years working with small and mid-market businesses SME’s is the dysfunction, or even the abdication of the lead management function. The weakness is the central cause of the disruptive, unpredictable growth patterns for most B2B SME’s. Converting those opportunities to sale ready leads, where you new sales function takes over. While the primary responsibility of this function lies within your marketing function, it is critical that your marketing and sales functions be fully aligned and integrated for successful implementation. Not all prospects are created equally, and not all prospects should be managed in the same way. At its simplest you want to separate strategic prospects from standard prospects. Strategic prospects represent your best growth opportunities, and they should be handled with greater focus and separately from normal opportunities. 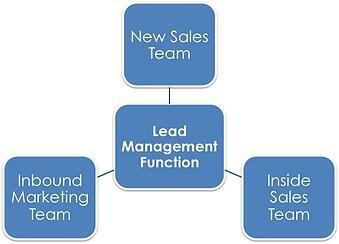 Inbound marketing team: that is developing and sharing valuable content that challenges, influences and engages. Inside sales team: responsible for connecting with leads as they’re generated, moving them through the early parts of the sales process and converting them to a sales-ready status. Additionally, this would be the team that is responsible for implementing outbound methods. In larger, more advanced organizations this could be two distinct teams. New sales team: responsible for taking sales ready leads and moving them through your sales process, as well as performing targeted lead generation. I realize that some companies are not big enough to support three full teams. In those cases there are two approaches you can take. You can maintain this three-team approach, realizing that one or more people will comprise multiple teams. Or, you could eliminate the inside sales team, splitting responsibilities between your inbound team and your new sales team. Word of caution: This is often the default choice. The theory being that it’s the best way to save money. The reality is often opposite. In reviewing hundreds of sales structures for SME’s, I’ve found that maintaining an inside sales team is the lower cost option at least ¾ of the time. With your teams clearly in place, it’s time to assess responsibilities to each team for lead generation. This is the beginning of your ability to create an effective service level agreement (SLA) between sales and marketing. As I’ve shared before (and you can review in our eBook Aligning The Sales & Marketing Function) creating an effective SLA is a critical piece of the foundation for an effective, scalable sales growth process. While the details of an SLA are different for every organization, the basics are the same. In creating the SLA, it ‘s important that you ensure a connection between the objectives associated with leads and the desired end result (sales). To do this, there is some math involved (or you can use our Lead Generation Calculator to do the work for you). 5 - $500,000 average sales. 30 - $116,667 average sales. Note that these are guides to planning, not written in stone. All three teams support the successful implementation of the program. Win (Closing) Rate – the percentage of proposals (for lack of a better term) that result in closed sales. Fit rate – the percentage of sales qualified leads that turn into a proposal opportunity. Conversion Rate – the percentage leads that turn into sales qualified leads. The New Sales Team needs to focus on 58 prospects that can average $500,000 sales. The Inside Sales Team needs to create 184 leads. The Inbound Marketing Team needs to create 1,010 leads. With the numbers clear, it’s now time to create the execution plan and the tracking mechanisms to make it a reality.